New York advertising agency BBH New York and New York Rescue Mission have been recognised with Gold awards for Social Media, Content and Contact at the 2012 Clio Awards, for the “Underheard in New York” campaign. In February four homeless men were provided with prepaid cellphones and Twitter accounts, along with training in Twitter skills, giving the public a true glimpse of homelessness. 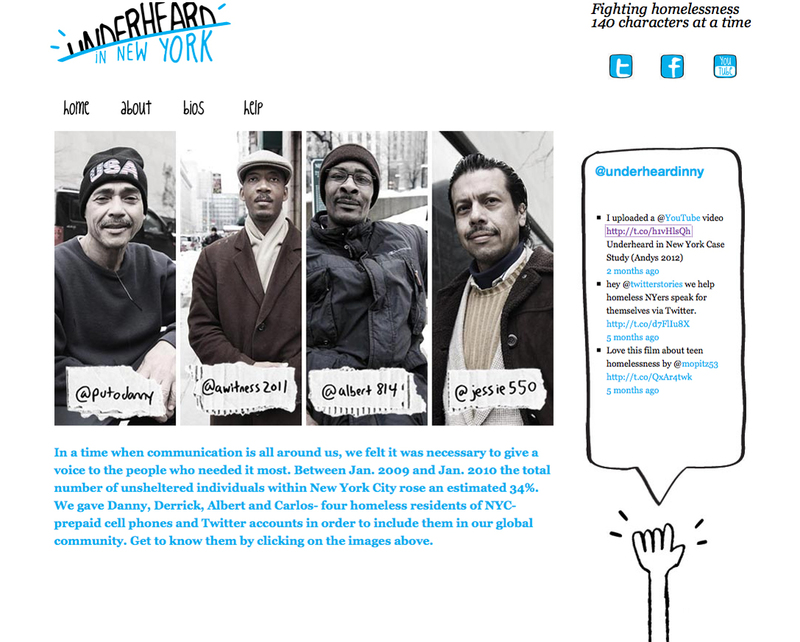 Danny (@putodanny), Albert (@albert814), Derrick (@awitness2011) and Carlos (@jessie550) had their Twitter stories promoted online at underheardinnewyork.com and @underheardinny. All four have found support at the New York City Rescue Mission. The Underheard in New York campaign was developed at BBH New York by creative interns Rosemary Melchior, Robert Weeks and Brian Moore, creative directors Jessica Shriftman and Zac Sax, art director Willy Wang, account director Dane Larsen, strategist Heidi Hackemer, and director of innovation Saneel Radia. The Underheard in New York project was inspired by We Are Visible, an initiative by Mark Horvath designed to empower homeless people through social media.